I ain’t no fashion blogger. Seriously. I have one style. Straightforward. 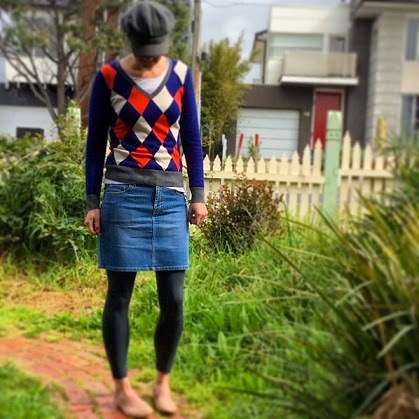 Choose a top, choose pants that match (or at least don’t clash), choose shoes, throw on a coat (usually – I’m a Melburnian, after all) and walk out the door. Sometimes – maybe – I’ll do something more with my hair than just throw it back in a ponytail. Sometimes – rarely – I might even attempt make-up. So why on earth do I take a photo of my outfit every day, and participate in Styling You‘s #everydaystyle? It’s pretty simple, really. I do it for all of the reasons I just listed. I don’t feel like I have style. I don’t make an effort. Or I didn’t. I’m getting there. Before I started playing along with #everydaystyle, I had five or six outfits that I just rotated. 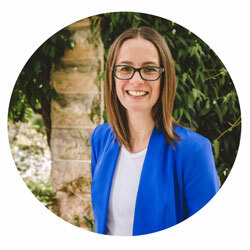 I had a work wardrobe that had lain dormant for four-and-a-half years, a special occasion wardrobe that scored a quick glance from time to time, and a whole heap of clothing I didn’t bother looking at because I was pregnant/had just had a baby/was breastfeeding/wasn’t back to pre-bub weight/was trying to conceive/was pregnant for the second time and MUCH bigger/had just had a baby/was breastfeeding/had given up on ever getting back to pre-bub weight. And I had tracksuit pants. Good old reliable tracksuit pants that I’d wear on days we didn’t have concrete plans. Which was most days. It stops me from saying ‘I can’t be bothered changing’ or ‘I can’t be bothered putting something else on’ if I’m invited somewhere at the last minute or if my kids want to go out. In fact, it makes me seek new things to do with the kids every day, because when you get out of the stay-at-home mentality, you get out of the home. It makes me look at my wardrobe. At everything in my wardrobe. Things that were reserved for special occasions are worn more often. Things that were always paired with certain tops and bottoms find new mates. Things that I thought didn’t fit either do fit (surprise! ), fit in different ways or can be given to charity instead of being kept ‘just in case’. This jumper was in the ‘won’t fit me for years’ pile. It makes me feel like part of a community. Those who participate in #everydaystyle range from the fabulously fashionable super special sparkly fashion bloggers to those who tag their pics with #notafashionblogger. And everyone in between. And, shallow as it may sound, it just makes me feel better. I know it probably shouldn’t and I should just feel 100% totally gorgeously smoking HAWT all the time, no matter what I’m wearing, but I don’t. Of course I don’t. Does anyone? I also know that I could just do this anyway, without posting the evidence. But I’m a girl who needs to be held accountable to something to make it stick. If I have to post the proof online, I’ll make the effort. I can even have fun with it and post the ‘please tell me you’ve stopped taking photos now’ out-takes. So I play along. I used to play along on Facebook, and post weekly montages of the previous week’s outfits. Now I’ve joined Instagram (trendsetter alert! ), so I post the pics there daily. There you have it. Just some of the reasons I participate in #everydaystyle. Thank you, Nikki from Styling You, for making me feel just a little bit better about how I present myself to the world every day. Do you participate in #everydaystyle? Why or why not? You’ve convinced me! 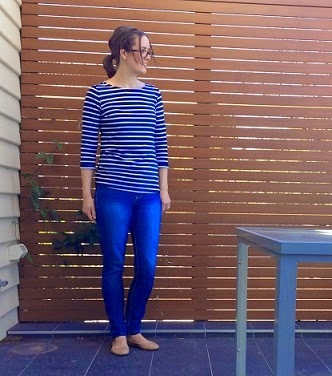 I’ve just posted by first ever Instagram #everydaystyle post, which is also my first ever outfit post! Hip hip hooray! Will be checking it out to see if you’re still going! I don’t really participate in it but I agree that feeling good about yourself is always in style.. At work I wear the usual business pants/ skirt and blouse. When I am home on the farm I try to wear outfits that look good because they do give me a lift, unless I have to do sheep work etc. There ain’t nothing stylish about my sheep work out fits. I think #everydaystyle would benefit from seeing some real honest-to-goodness sheep work outfits! It’s what’s been missing this whole time! I hope you don’t mind me saying this Em but with your height and body shape you could wear a sack and make it look good. Plus you seem to have the layering thing down pat. Something us North Queenslanders can’t take advantage of. Thanks – that’s lovely (if weird!). With my long torso, I invented layering WAY before it was cool. (Was it ever cool?) Tops are rarely long enough by themselves. Nice post Em! I love #everydaystyle – I almost do it for the opposite reason to you (but in a good way opposite) – I’m a Style Coach and I spend my life trying to help women find their own sense of style. For me #everydaystyle is to show those women, and my blog readers, that it can be really easy to feel good in what you choose to wear and that you don’t have to have a) the perfect size 10 body, which I certainly don’ t and b) a big bank balance – again, something I’m not blessed with. Keep up the great work, you look amazing everyday! Thanks Cait! I love your Instagram shots. Heading over to check out the blog now. Thank you so much, Vicki! Very few things are still in my ‘special occasion’ wardrobe – they’re being worn much more often now. I think it’s a fabulous thing and for the record you look fantastic. I don’t know about all this pre-bub post-bub thing but I think most women would be delighted to look as good as you. Thanks, Nicole! I don’t mean it in a grumpy way, just a matter of fact – my body is very different than it was before I had kids. I’m re-learning what suits me and what feels comfortable. Getting there. Thanks for your kind words. I hear you Em! 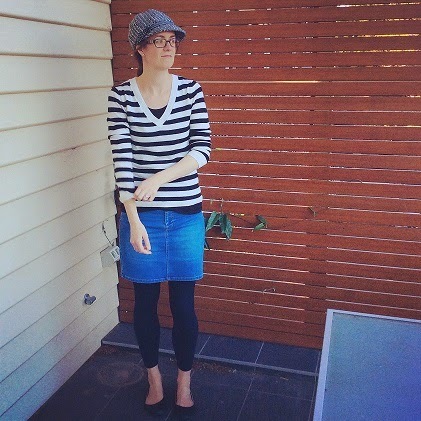 I have been a fan of #everydaystyle for ages, but have never had the confidence to join in. 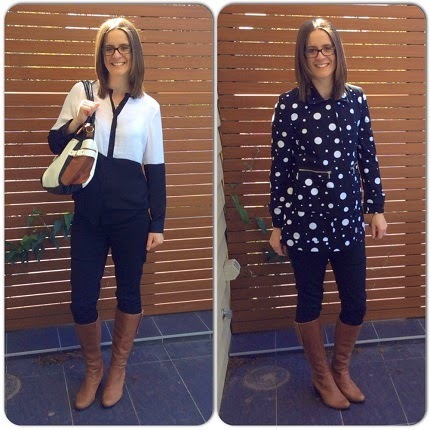 This month I have participated in #foxinflatsstyledare and have loved it! It has made me put effort into what I wear each day and has really pushed me out of my comfort zone. I have loved some of the styles that I have done and they are now part of my wardrobe, which has been great. You have inspired me with this post and I have now done my first ever #everydaystyle, losing a few kg’s has helped too! I have followed you on IG so hope to see you around @ #everydaystyle! I may just have to get on board #foxinflatsstyledare next time it comes around again! Looks like fun. I’ll have to give the lipstick ones a miss though. Can’t stand lippy! You are so full of awesome my dear. This post makes me want to join in as well, only I am currently living out of a suitcase with a selection of clothes best suited to living in the bush unseen by anyone other than those that love you! oh my gosh how cute are you??!!? I love your style – especially the “We’ve been invited over for a play, let’s go” look! Thanks, A! Yep, those shoes were hand-me-downs and I LOVE them. I think you have convinced me to give this a go myself. I’m afraid I’m going to finish work this week and just be a dag at home. I love that this challenge has helped you get out more and do more with your kids as well as making you feel better about yourself. You go girl! Thank you, Vicki. This weekend is a cleaning the house weekend – I’ll have to post a few pics with the rubber gloves and trackies on! HAWT. I joined a group last week for plus size fashion and a couple of times I have posted an out of the day in there and on those days I have felt better about my choice. Like you, I do find on the days that I make the effort to create an outfit that I do more because it’s not as much effort to leave the house. You look great and I hope you keep it up with the everyday style! I like the accountability. I don’t even change what I wear that much, but it makes me brush the hair again or think about my shoes instead of grabbing the pair nearest the door on the way out. Oh stop it! You are smoking. I just love this post. You’ve actually inspired me to join in. I’ll have to read the details on Nikki’s site. It is easy to fall into the trap of wearing your old daggy clothes when you’re home with the kids, especially when they’re younger and your clothes have the potential to be vomited on one thousand times. I always feel better when I look good too. I think I’m definitely going to give this a go. Ps. You have a great sense of style. Pps. I wish I could get my hair as straight as yours. Pps. Who takes your photos everyday? I have been LOVING your pics on facebook! Thanks for joining in! I figured since I spend my life in the laundry anyway, I’ll just not care about the vomit and snot the kids constantly wipe on my clothes! P.S. Thank you. P.P.S. My hair is naturally curly. I heart my GHD. And hats. I heart hats big-time. P.P.P.S. My daughter, usually. Sometimes my husband on the weekend, but the daughter actually loves doing it! 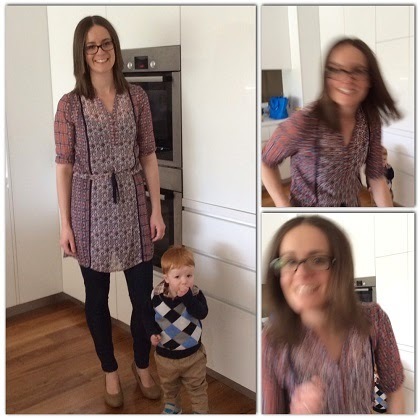 From one mum to another – you have a great post-baby body! GAH!!! Work it!! You look fabulous! Thank you! I don’t do this for comments like that, but I won’t pretend they don’t feel nice! I know I’m lucky to be slim, but my body IS very different to what it was pre-kids. Still getting used to what suits me and what I feel comfortable in. Yes you do! I love my denim skirt. (This one’s from Coles. COLES.) And there’s nothing like having a daily commitment to make you dress better! I’ve said it before, but I love your style. You always look so great and relaxed and comfortable. Plus I think we have similar taste in some clothes. I wish I could rock a beret like you can. You were actually in my mind while I was writing this post! Seeing you become more confident in your pics made me think there was something to it. I live most of my days in the same clothes because I really do have hardly anything that fits and it would get so boring fast. I do however understand the mentality behind it and I know that when I dress up a bit I feel more inclined to do stuff. 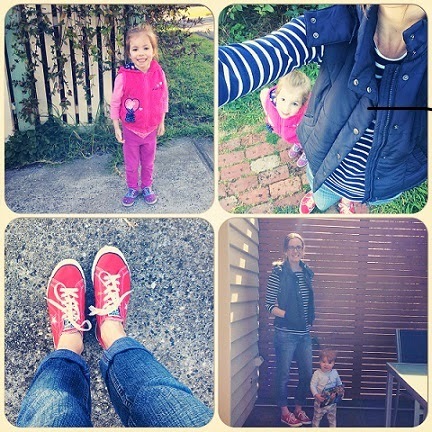 I learnt about 8 months in to motherhood that if I ever wanted to get anything done ever again then I needed to make an effort to change out of my trackies at some point in the day. Now, on the days we don’t go anywhere, I give myself an hour to have breakfast and a coffee and then I make myself get dressed. If I get dressed then I am way more inclined to actually do some housework or other kind of stuff around the house. If I stay in my trackies then I just don’t do anything, so changing has become my motivator. Once the jobs for the day are done though, it’s back in to the trackies! I hear you. Putting the trackies on at the start of the day is like admitting to myself from the get-go that I can’t be bothered doing anything all day. But they’ll usually end up back on me after dinner. Or just straight into the pyjama pants! I’ve been following your everyday style for awhile now (and I mean that in a totally non stalkerish way) but have always been too nervous and self conscious join in the fun. Thank you for the inspiration, I’m going to give it a go – starting today! AAARGH! STALKER! Just joshing. Please do! Hip hip hooray!